“I remember.” The fight for joy. It was an extremely me-centric post complete with all the all the ways I perceive people to be careless in their words, all the ways I’m still hurting, all the ways people don’t understand, all the ways I want the focus to be about me. But I deleted the whole thing. I understand when the psalmist says “My soul thirsts for God, for the living God. When shall I come and appear before God? My tears have been my food day and night.” (Psalm 42:2-3) I wanted God, but He didn’t seem to be listening. I think of the verse that says God keeps tears in a bottle, symbolizing that He’s intimately aware of sorrow. I imagine my tears fill an olympic-size swimming pool. I’ve set a familiar scene and delineated the rising tension. Here’s the relief. My confident expectation is in the God who created me, pursued me, purchased me back, and won me through the blood of His Son. Jesus more than any other knows what it is to be forsaken. He was alone, so I don’t have to be. I remember the joy and delight of intimacy with God. I “shall again praise Him.” Delight will come again. I remember that He is the Rock, the stability when waves toss me about. I change. He changes not. My Savior provided the very thing I long for, intimacy. I have total access to the presence of God. I don’t rejoice always. I don’t always have an abiding attitude of trust, or take pleasure that all things in my life are according to God’s will. But Jesus accomplished what I cannot. He rejoiced always. He gave thanks in all things. He prayed without ceasing. His performance is the standard, but it is also my standing. Rather than crush me, in Christ the command allures. It brings me to dependence. Because I know the good news of Jesus is real, I can rejoice. I can have abiding trust, overflowing thankfulness, and unceasing dependence. 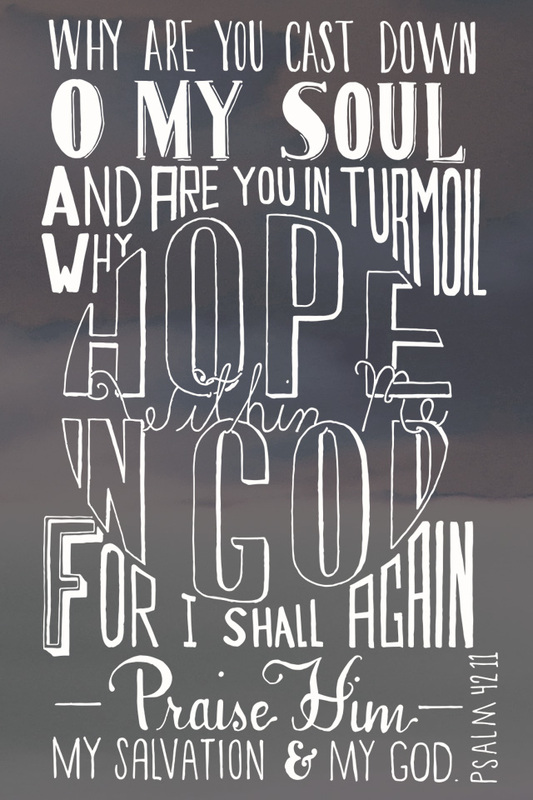 O my soul, hope in God! I can’t walk this life alone. God uses His word and the community of faith so beautifully. He brings me back. I’m so thankful for a friend who pointed me to Psalm 42. Even amid his own struggle, he was an instrument of grace to me. I’m thankful for a sermon that crushed me with the weight of “rejoice always,” but rebuilt me with the beauty that I am able to rejoice because of my standing in Christ. So, I lift my head, I hope in God and I see these marks of lavish grace! < Previous HE is the Spring! Next > Good Shepherd may I sing your praise. Im meeting with a pathologist tomorrow in hopes of a play by play on how Mark departed this world. This post couldnt have come at a better time. Know your NOT alone on this subject/thoughts/and matters.